The order of the units will be interesting-nice pile accomplished! Finally to the assembly part!!! This should be fun. How long does this go on? Or how many clues are involved? I like the fabrics above. 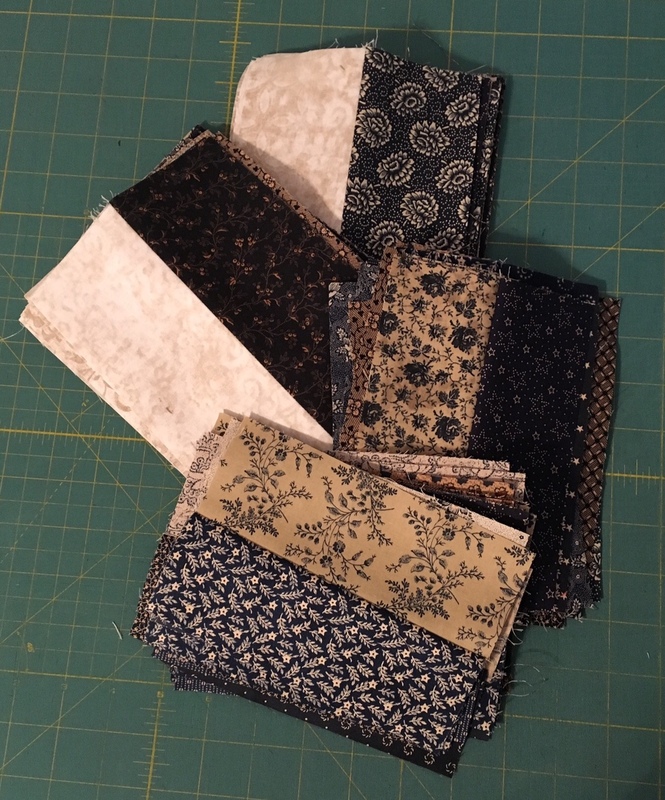 This is the exciting part of a mystery quilt, when the parts are ready to begin assembling. Love that gold in there with the dark blue. I like that gold fabric with the deep blue flowers. How fun to finally be ready to assemble the pieces and see what it will be. The soft contrast of darks and lights will be a soothing quilt look, I imagine! Pretty colors!! I can imagine how it will look when finished. Can't wait to see it. I love that neutral color scheme. The patriotic ones are nice too, but this falls right in line with my color esthetic. You are doing a great job of keeping up. I'm so impressed! So have you been playing with pieces to see if you could come up with the block?